Preferred providers of Invisalign® clear braces, Dr. Jordan and Zachary Tilden, have offered teeth straightening solutions in their Chicago neighborhood dental practice for 10+ years. Straight, uniform teeth are what many people wish to attain. With Invisalign Express, Invisalign Teen, and full Invisalign® from Tilden Dental Group, you can have the smile you’ve always wanted. Ready to start your smile makeover? Contact Tilden Dental Group today! Unlike traditional metal braces where brackets and wires are fixed in place, Invisalign® uses a series of removable, custom clear aligning trays to achieve straighter smiles. If you have unevenly spaced or crowded teeth, misaligned bite, or an off-center smile, this clear braces solution is right for you. These nearly invisible aligners straighten teeth and do not interfere with day-to-day activities. This inconspicuous solution allows patients to have a straighter smile without foregoing their aesthetic needs. Diet and at-home oral care are not impacted by Invisalign®. However, it is important to remove aligners before you eat any food. To ensure that bacteria aren’t trapped under the aligner, it is recommended to rinse the trays before replacing them. Be mindful about removing your aligners before you eat and drink for easier at-home care. At Tilden Dental Group, we have found that 90 percent of cases we see can be treated with Invisalign®. As it is primarily used to correct mild to moderate functional and cosmetic concerns, cases can be as little as $2000. Dr. Jordan and Zachary Tilden provide clear braces to teens and adults who wish to have straighter smiles. Whether you are a first-time orthodontic patient, or are experiencing relapse, we create a custom treatment plan for your aesthetic concerns. Your Invisalign consultation begins with 3D mock-ups and impressions of your smile to fabricate your aligners. You’ll receive a full treatment report, as well as a glimpse of what your future smile will look like once treatment is completed. Your series of aligners are created to address your specific alignment needs. 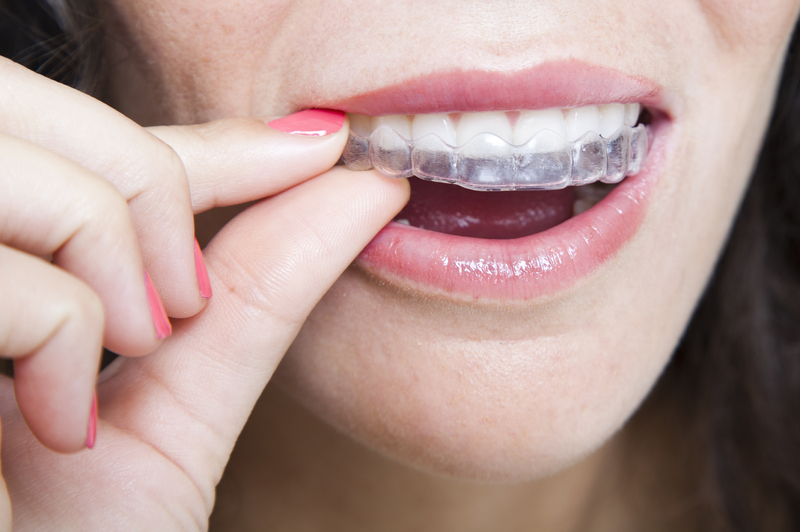 Worn for 22 hours a day, and interchanged every two weeks, these clear aligner trays gradually straighten your smile. At Tilden Dental Group, our Invisalign treatment plans are focused on your concerns, helping you achieving the smile you deserve. Our Chicago Invisalign® dentists are located in Streeterville. Dr. Jordan Tilden and Zachary Tilden are dedicated to helping their patients have healthier, straighter smiles. Contact us at our Chicago dental practice today to inquire about our clear aligner solutions or to schedule an appointment today!